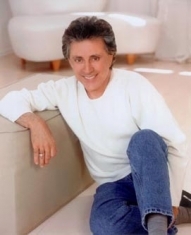 Frankie Valli…A true American pop music icon. His incredible career as a solo artist and with the Four Seasons has produced 19 top ten hits and sold over 100 million records world wide. He was inducted into the Rock and Roll Hall of Fame in 1990 and named longevity champ of the rock era by Billboard Magazine. In 1962 Gaudio wrote a song called “Jackie”, named after Jacqueline Kennedy. It was written in about 15 minutes. Bob Crewe took it to Vee-Jay Records after changing the name at the last minute to “Sherry”. Sherry was released in the summer and moved slowly until the group performed on “American Bandstand”….”Sherry” sold 200,000 copies the next day catapulting Frankie Valli and the Four Seasons into rock and roll superstardom. Gaudio wrote or co-wrote and produced almost the entire four Seasons catalogue with heavy involvement by Bob Crewe. With “Sherry,” the Four Seasons had crystallized a distinctive musical style…the popular doo-wop music of the 1950′s inflected with the rhythm and blues influences that would come to define much of the music of the 1960′s. With Frankie’s dazzling falsetto as its trademark, the Four Season’s sound would become one of the most enduring in all of rock and roll. Over the next few years the Four Seasons followed “Sherry” with such unforgettable original songs as “Big Girls Don’t Cry,” “Walk Like a Man,” “Candy Girl,” and “Rag Doll”, all of which became rock and roll classics. As the Four Seasons were working to perfect and expand their style, a rock and roll revolution was brewing. In 1964, the Beatles came onto the American music scene, leading a British Invasion that would decimate the careers of scores of American pop music acts. The Four Seasons not only survived the Invasion but continued to thrive; they had three top five hits during 1964, a year in which the Beatles dominated the charts. The year 1967 saw Valli’s “Can’t Take My Eyes off of You” rise to number two, while “I Make A Fool of Myself” and “To Give (the Reason I Live)” both became Top 40 hits; the Four Season’s also had three Top 40 entries that year, including the gold selling “C’Mon Marianne”. For the next several years Frankie Valli and the Four Seasons continued to tour extensively, playing to packed houses throughout the United States, Europe and Asia. In 1974 Frankie was back on top of the charts, going platinum with the bittersweet ballad “My Eyes Adored You”. “Swearin’ to God,” with its disco beat and contemporary sensibilities went gold, climbing to number six in 1975. That same year “Our Day Will Come” reached No. 11 on the charts. In March of 1976 “December, 1963 (Oh, What a Night)” climbed to No. 1 staying at the top for 3 weeks. Frankie scored another megahit in 1978, with the title track of the best-selling “Grease” soundtrack. More recently, “December, 1963 (Oh, What a Night)” appeared on the soundtrack to Forest Gump, and re-entered the singles chart. Owing to its second lease on life, it became the longest-charting single in history with fifty total weeks. Frankie Valli has continued to woo audiences throughout the world both with his recordings and live performances for almost four decades, truly making him one of rock and roll’s most enduring performers.